Wisdom of Life. : Simply irresistible! Wife: I won't be able to sleep afterwards.. Wife: Alright, I'll do it. Wife: I can't find it. Husband: Oh, for heaven's sake, feel for it! Wife: Now go to sleep, and from now on when you want the window open, do it yourself. Now, what were you expecting? Of course, I was expecting something different! I hope they are still getting what I was thinking though! Everything is possible...I am sure they will get what they want. 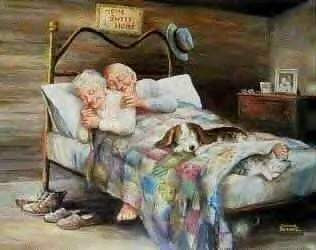 I made a wish...to grow old with my soul mate because the best is yet to come.